Members of the Eastern Brook Trout Joint Venture are deeply committed to maintaining and restoring brook trout and the watersheds upon which they depend. The information presented represents the first stage of the Joint Venture’s efforts to spearhead a collaborative process to improve brook trout habitat and return one of our most beautiful gamefish to its native range. For the original full-color .PDF of this information please click here, Back the Brookie Project. The assessment tells a somber story of brook trout decline across their range, but the data also offers hope for restoration and recovery in many areas. 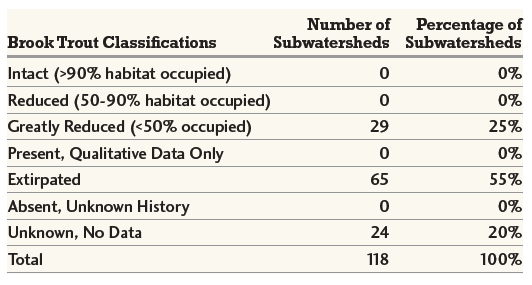 Intact stream populations of brook trout (where wild brook trout occupy 90-100% of their historical habitat) exist in only 5% of subwatersheds. Wild stream populations of brook trout have vanished or are greatly reduced in nearly half of subwatersheds. Over 20% of the subwatersheds across the Eastern range are documented to be extirpated, meaning that brook trout have vanished from all streams and rivers within those areas. Despite their sensitivity to declines in water quality and the introduction of non-native fish, brook trout have managed to persist in countless headwater streams across the eastern United States. Many opportunities currently exist for the restoration of brook trout habitat. For example, working with farmers and other landowners to replant streamside shrubs and trees and fence livestock away from streams can dramatically improve water temperatures and water quality in a relatively short period of time. Liming and other acid abatement techniques can neutralize acid deposition and abandoned mine drainage and make thousands of miles of streams fishable. Protecting forested watersheds can ensure healthy populations and pristine water quality far into the future. Selective removal of non-native fish where appropriate to protect brook trout is an effective management tool that is gaining increasing popularity among biologists. Replacing poorly designed culverts and removing old dams that block fish movement can reconnect fragmented habitat and strengthen or extend brook trout populations downstream. People value brook trout not only for their beauty, their delicious taste, and their sportfish qualities, but also as indicators of the broader health of the watersheds where they live. A sentinel of superior water quality, the brook trout will always mirror the health of the Appalachians and the waters that drain from these landscapes. This assessment sets a benchmark for fisheries managers, policy makers and citizens to track and assess progress in protecting and restoring eastern waters and their native trout. Collective efforts to restore the brook trout will enable us to protect human health, assure clean and sustainable water supplies and preserve our quality of life for generations to come. Brook trout (Salvelinus fontinalis) are the only trout native to much of the eastern United States. Arguably the most beautiful freshwater fish, brook trout survive in only the coldest and cleanest water. In fact, brook trout serve as indicators of the health of the watersheds they inhabit. Strong wild brook trout populations demonstrate that a stream or river ecosystem is healthy and that water quality is excellent. A decline in brook trout populations can serve as an early warning that the health of an entire system is at risk. Eastern brook trout reside in the most heavily populated and intensely industrialized region of the United States. Land use decisions made over the past several hundred years have severely impacted the quality of brook trout streams and rivers–largely by removing streamside trees and increasing sedimentation and nutrient runoff. While some sections of the East have regained forest cover and are healing from the widespread clearing of the eastern forests, other areas are undergoing rapid change as our population, road network and water needs continue to grow. In Georgia and South Carolina, the genetically distinctive Southern Appalachian brook trout has largely retreated into isolated headwater streams on public lands managed by the U.S. Forest Service. These states contain no remaining intact or reduced subwatersheds. While poor land management, roads, and urbanization impact over 75% of brook trout subwatersheds in Georgia, rainbow trout are the most pervasive impact. Southern Appalachian brook trout are present at greatly reduced levels in only 25% of their native range in Georgia and South Carolina. Over 55% of subwatersheds are confirmed or suspected to be extirpated, and population status is unknown in approximately 20%. 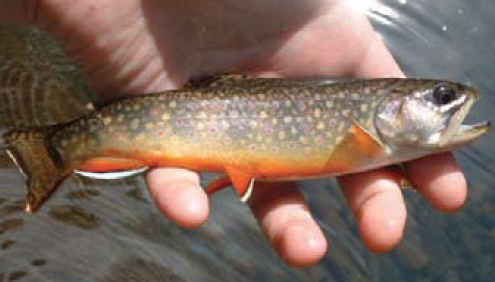 All remaining brook trout populations exist in isolated headwater streams. In Georgia, all but one of the remaining brook trout subwatersheds are located on national forest lands. Similarly, in South Carolina, three of the seven subwatersheds that support brook trout are located in national forests. The Southeast mountains endured harsh land use practices over the past several centuries. Timbering, instream log-drives and poor land use practices increased stream erosion and opened the shaded streams to the sun, degrading waters with silt and raising water temperatures. In response, brook trout retreated to small, headwater streams. To fill the void, many streams were stocked with non-native rainbow trout and brown trout. As the landscape healed and water quality improved, these non-native trout expanded their range and now compete with brook trout for food and space. Rainbow trout now thrive in 96% of Georgia’s subwatersheds that have brook trout data. Regional experts identified poor land management, road sediment and urbanization as current impacts to brook trout habitat. These disturbances are widespread throughout the brook trout’s southern range, and they result in increased sedimentation that suffocates trout eggs and aquatic insects. Because Georgia and South Carolina represent the extreme southern limit of brook trout, local habitat is particularly sensitive to land use changes that raise water temperatures. 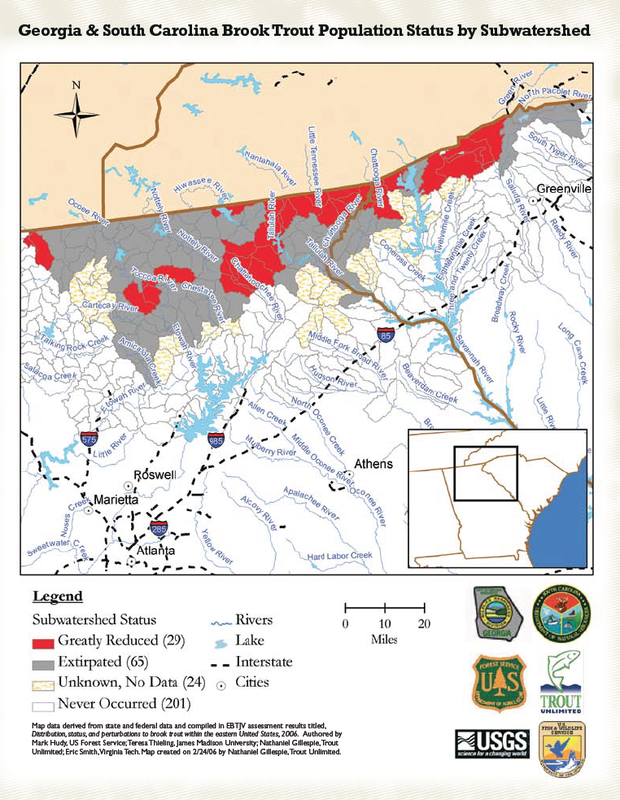 The majority of remaining brook trout streams in Georgia and South Carolina are located in the Chattahoochee and Sumter national forests, where they are protected from future land use changes. The protection and connection of these small, fragmented populations to lower elevation rivers will ensure their long term survival in the face of droughts and floods. The restoration of streamside areas, improvement of stream habitat and the selective removal of non-native fish can strengthen existing populations and restore others to other portions of their original range.